I am trying to deploy a Web Service I created with Talend ESB on Tomcat, but I do not seem to find a way to do it. I have been searching for some online information and I have had a look at the examples provided with the Talend distribution, but it uses other types of examples, not Talend generated classes. Could anyone point me in the right way to achieve this? I would like to be able to reuse the code generated from Talend. What's your job design? Could you please export your job as .war type ans then copy the War folder and paste it in the Tomcat webapp directory? See the related forum How+to+export+Jobs with scenario. Thanks very much for you reply, but I'm afraid that is not what I am trying to do, it describes how to deploy "any job" to be run as a Web Service and what I want to do is to deploy a "Service" in Tomcat. I am designing a Service within Talend ESB: I create a service from an existing WSDL and assigning the invoke method a new job (myws); the job is mapping the input with some transformations and sending a response back to the Web Service requester. (See pictures attached). I can export this service as a .kar file to be deployed in Talend Runtime ESBE, and it all works fine; I can invoke the Web Service and I get the response I expect. What I would like to do now is to be able to deploy this service in Tomcat. Do you know if this is possible? If so, could you please give me some guidance? If so, I think you are looking for How+to+deploy+a+data+service. Thanks for your reply, but this is not what I am looking for. I already did this, because my service is successfully running within the Talend Runtime ESBE. What I would like to do now is to deploy my service in Tomcat, instead of the Talend Runtime ESBE. A .kar is intended to run in Talend Runtime (aka Apache Karaf). Kar stands for "Karaf Archive". I know that a .kar is intended to be run in Talend Runtime, and I am getting this to work fine with the Karaf container provided by the Talend distribution. What I would like is to be able to deploy the service I am designing with Talend ESB in Tomcat. Is there any way in Talend to export a Service so that it is deployable directly in Tomcat? Something similar to the deployment of the .kar in Talend Runtime, but with a .war in Tomcat? Job Designs -> DemoService, Right click menu -> Export Job, select the export type: Axis WebService (WAR), you will got an DemoService.war which can be deployed into Tomcat container. Thanks for your suggestion, I tried it but unfortunately it does not work as I would like. Deploying the job as you say means that I am deploying the Talend job that wraps my service, and the wsdl of the service that is deployed is as shown in the attached image (TALEND WSDL). But because my service is always listening, it never returns a response to that call, and this also means that every time I wanted to deploy my service I would have to invoke it that way. 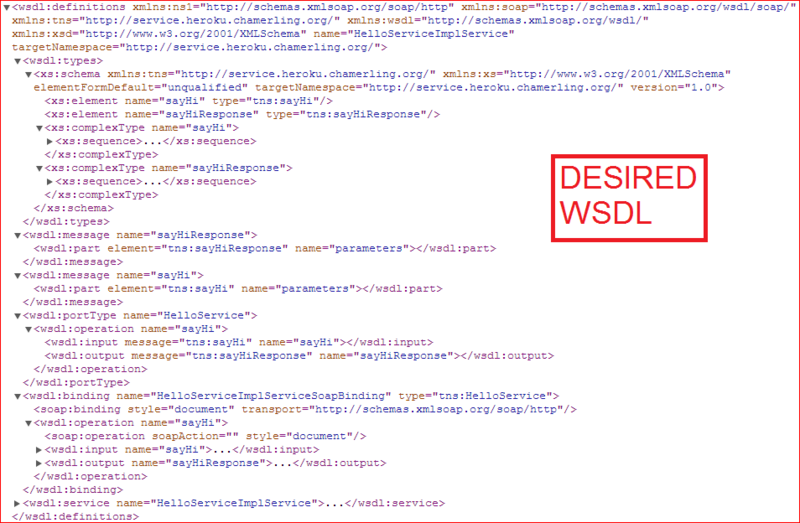 I would like to be able to deploy my service directly in Tomcat, so my wsdl is the one that my service defines, shown in the attached image (DESIRED WSDL) and I don't want to invoke it through the Talend wrapper service. Many thanks for all your replies, but I think you don't understand what I am trying to do. What I would like to do is deploy my service (created as a Service in Talend ESB) directly in Tomcat, not wrap it on a Talend job exported as a war. But I guess Talend does not provide that feature yet. Absolutely correct. Talend ESB Services designed, packaged and exported from the Talend Studio can't be deployed into Tomcat (or any other Application Server). You'll have to use the Talend ESB Runtime. Create My Job added rest Request/Response did SQl transactions and some manipulations. Everything worked fine in Talend Version 5.3.1 but once i performed the steps mentioned like creating a war file and deploying in Tomcat i am getting weird error messages and not able to figured out that my service is running or not. After that once i resolved this after removing this jar and deploying again i am still not able to make my war file run. I am also looking a way to deploy REST service in Tomcat created using Talend ESB but not able to acheive. This is crusual for our development and nw trying to figure out whether Talend is suitable for our development or not based on this capability. Unfortunately, if you want to deploy the Web Services you create with Talend, you need to use the Talend ESB Container that is shipped with the ESB package; there is no way of deploying them in Tomcat so far. Sorry for my bad english and thanks for your help.